Create your own high-quality art for a new Prismata skin or emote. You can use any of the Prismata unit art as a base, and you can submit as many entries as you want. Winners will have the opportunity to have their art included in Prismata and be credited as a Prismata skin or emote artist. Submit entries by email to skincontest@lunarchstudios.com by August 24, 2015. 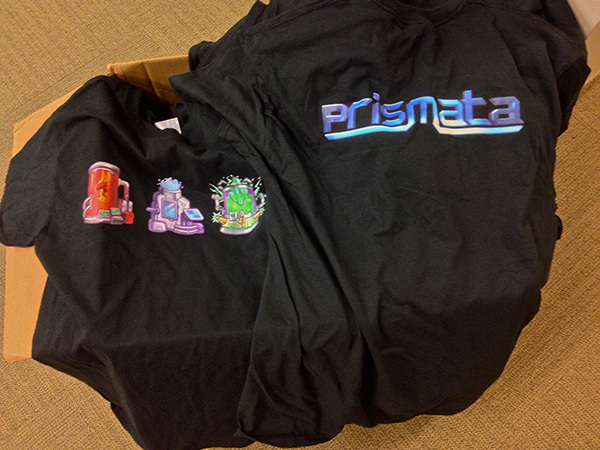 Grand prize: our favourite submission will receive a Prismata T-shirt and a Luminary Tier Prismata founder pack valued at $250. This pack includes redeemable codes for a massive list of perks, $130 of in-game currency, and the opportunity to access to our private test server and secret online developer community. Winners: Lunarch Studios will select up to 20 additional winning entries (possibly more) based on the quality and originality of submissions. All winners will receive $70 of Prismata in-game currency for each winning entry. Thanks to Prismata player zzz for the idea for this one. Entries must be submitted as .png files with a transparent background. Images must be square and at least 300×300 in size. Bleeding (edge-clipping) on askinshould be confined to the same edges as the original unit. For example, skins for Gauss Cannon can bleed off the bottom edge of the 300×300 area if desired, but skins for Iso Kronus should not bleed at all. In particular, NO SKIN can bleed off the top edge. It looks ugly next to the unit name text. Most skins should get a dark/black outline around their boundary to preserve contrast against a variety of backgrounds. Exception: energy/fire/lasers/beams/etc..
Any Prismata unit, including base set units, can be used. We’re looking for stationary images for the emotes, like the Wall emote above. No animation. Images should be at least 140×140 in size, with an aspect ratio between 1 (square) and 1.75 (7 to 4). Creativity matters more than artistic skill. Something like the Googly-Eyed Frost Brooder skin above can win over a more technically challenging entry. Visual metaphors, like Amporilla holding a giant lollipop, generally work very well. Skins need to be recognizable as the original Prismata unit! Don’t change too much at once; it’s generally best to preserve most of the silhouette, colouring, and pose of the original. All artistic styles are welcome, but we favour those that are visually harmonious with the current look and feel of Prismata. Remember, skins and emotes need to look good at small sizes. Both can be shrunk to only 70 pixels high! Avoid using text, especially in ways that would impose difficulties when translating Prismata to other languages. All art must be original. The only permitted external sources are the Prismata unit art assets themselves. No random junk copy-pasted from Google Image Search. No external assets or image libraries are permitted, even if they are creative commons licensed or in the public domain. Winners must sign a release in order to have their art included in Prismata, and Lunarch Studios may request minor revisions if necessary. We will reject entries that infringe on copyrights. No dressing up an engineer as Iron Man. To enter, email your entries to skincontest@lunarchstudios.com by 11:59pm EDT on August 24, 2015. We’re looking forward to your exciting and creative entries!